American Arborist has the equipment and capabilities to do tree work with minimal yard disturbance. One way we can do that is by using alturnamats. Alturnamats are plastic mats we can put down to protect the yard from equipment. These perform better than simply setting plywood on the grass. Here we used the mats to approach a tree over this house with our bucket truck. Another way is by using our Vermeer S600tx mini track machine. Other companies may come in with a full size skid steer to remove trees. These large machines are sure to do some yard damage. Often we can leave a yard the same way we came. One piece of equipment that American Arborist uses daily is the Vermeer Mini Skid steer. This unit can be equipped with a variety of attachments. Here it is being used to dump stump grindings into a truck. We also have a grapple used for dragging brush and loading logs. The track unit allows us to drive on nicely manicured lawns without disturbing the turf. Despite what local nurseries might tell you, River birches are not a good tree to plant in Nebraska. Not only do they get an iron deficiency called chlorosis, they are a favorite for Japanese beetles. Japanese beetles are a recent epidemic to Nebraska and can kill branches or an entire tree by defoliating the tree. If you do have a Riverbirch, treatments can be done, but they are costly. Although we don't do any planting, feel free to ask us for a recommendation on what to plant in your landscape. 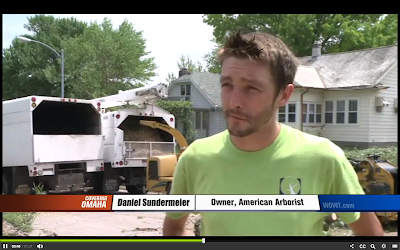 American Arborist was just recently in the news for working to clean up the city from all the storm damage we have had. Here is a link to the news story.